The K2 Power 8 Flipjaw ski poles are the king of the mountain. These men ski poles adjusts to match any condition no matter where you are on the mountain. The Power 8 Flipjaw is a FreeRide focused pole that uses LockJaw 2 clamp in an upside down format in order to keep the clamp high, reduce swing weight and increase stiffness. 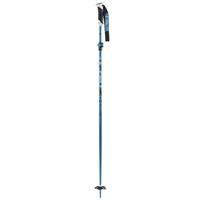 These men ski poles from K2 are made of 7075 high strength aluminum and are adjustable.